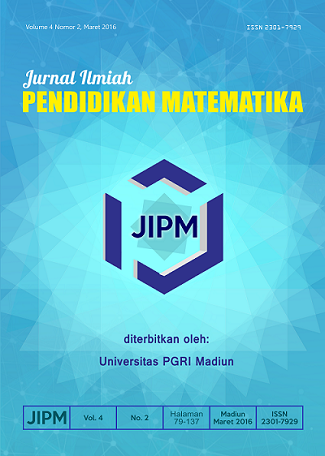 JIPM (Jurnal Ilmiah Pendidikan Matematika) is a semiannual journal, published on March and September. JIPM published by Universitas PGRI Madiun. JIPM provides a forum for lecturers, academicians, researchers, practitioners, and students to deliver and share knowledge in the form of empirical and theoretical research articles. The journal invites professionals in study of Mathematics Education, especially teaching and learning, curriculum development, learning environments, teacher education, educational technology , and educational developments.